Scoil na Maighdine Muire has recently secured its first Active School Flag. 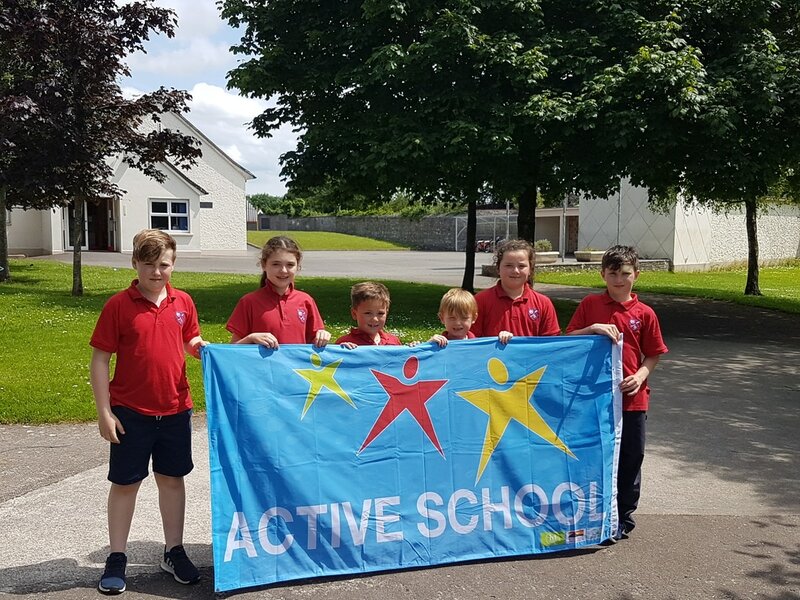 Our school was a very active school before we began with our children taking part in GAA, Irish Dancing, Karate, Gymnastics & Basketball both during and after school. However to be successful in gaining the Active School Flag we had to ensure the reccommended 60mins of activity is encouraged each day in our pupils lives. We know that activity and exercise is very important for both children and adults. It has numerous benefits, which are both psychological and physiological. We began our endeavours in January of 2016 with the introduction of Drop Everything and Dance. At 12.25 each day, we all put down our work and dance to our favourite songs on GoNoodle & Just Dance on youtube. We also marked out the corridors with footprints and measured them so the children could see how far they were walking in one school day. 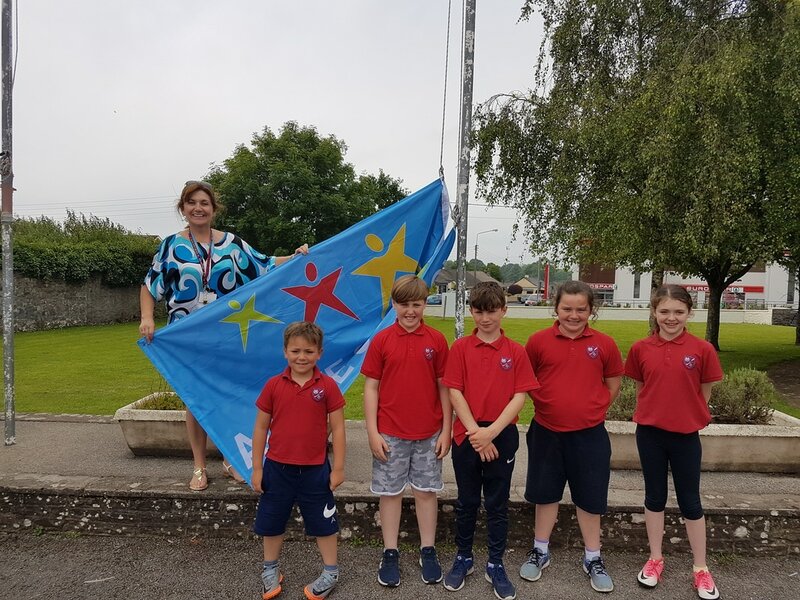 The 6th class pupils were tasked with walking around the central square of the school 221 times between them which equaled the distance from the school to Limerick city. The week was great fun for both teachers and students. A huge thank you is due to all the parents and friends who helped us out. Especially to the organisers of the Annual Pakie Ryan Memorial Run, who donated medals to the school for the children who completed the Run a Mile Challenge. We will hold another Active School's Week in 2017. Keep an eye here for details. Skipping was introduced on our yards as an activity for both girls and boys. Individual and group skipping really took off and in January this year we invited Skippy John from Skipping4Life to show us some skills. Skipping is a great way to both keep fit and have fun! Active Week 2017 occurred from the 15th-19th of May. It was another roaring success. 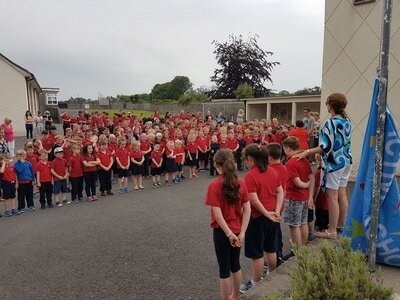 We had GAA, Orienteering & Tag Rugby. The week culminated in a great Sports for All Day! Thank you to all our parent volunteers and coaches for their help during this week. I is not possible without them. 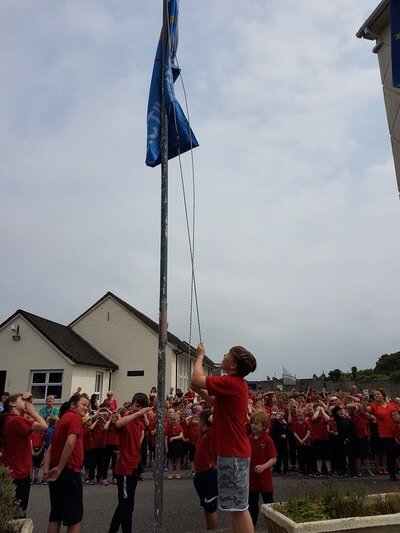 Check out the slideshow below for some great photos of the week's activities.